Exactly one month after releasing drafts of the sale documents to the public, the Sitka Assembly cast their votes in favor of selling Sitka Community Hospital to the SEARHC. 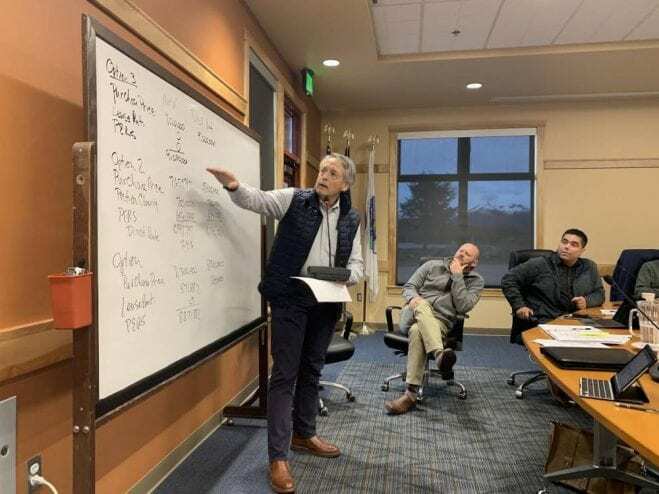 At a special assembly meeting on Monday night (4/15/19) the Sitka Assembly approved the final drafts of the asset purchase and lease agreements for the hospital, voting 5-2 in favor with assembly members Richard Wein and Valorie Nelson voting against. Mayor Gary Paxton said that the decision to sell did not come lightly. Last September, the assembly signed a letter of intent to negotiate the terms of the hospital sale with SEARHC. That negotiation process between the city’s team of consultants and leadership from both hospitals has been ongoing for the past seven months behind closed doors. But precisely how much SEARHC would pay for the hospital has not been clear until now. SEARHC put three options on the table: $8.3 million up front plus $700,000 toward the lease, $9 million up front, or 21 payments of $700,000 installments over the next two decades, plus additional money at the start, for a grand total of $16,746,000. City staff and the consulting team recommended the latter, saying it was unlikely the city could get as high of a return if they went with the $9 million upfront and tried to invest it themselves. The assembly chose option two- 16 million spread out over 22 years- and the payment option passed 5-1 with assembly member Richard Wein voting against. “For consistency I have to vote a particular way, but if I was inconsistent I would vote for option 2,” Wein said. Of the seven assembly members, Wein has been, perhaps, the most outspoken opponent to the sale. A surgeon who worked at both hospitals, Wein’s contract at Sitka Community was not renewed in 2017 for undisclosed reasons, and he was critical of hospital leadership when he ran for his seat on the Sitka Assembly later that year. At Monday night’s meeting he continued to voice concern about the sale – in particular he questioned what the impact would be to SEARHC’s beneficiaries in the Alaska Native community. “Beneficiaries feel they are being pushed out,” Wein said. “There are approximately 2000 beneficiaries here in Sitka, but there are 6000 non-bens. That’s a dilution factor which is pretty substantial,” Wein noted. But assembly member Aaron Bean, who voted in favor of the sale, said he felt Wein’s concern was misdirected. While there were over 40 people present, during persons to be heard, only 4 Sitkans voiced concern about the sale. Lucy Phillips said she still couldn’t see the need to sell the hospital. “SEARHC is not a viable option for me in my brain, I can’t wrap my mind around it. I have relationships with my doctors here, with my daughter, my husband, with my community members,” she said. And even for the assembly a few things are still unclear- like how much money the city will have to put in escrow, which could be around 4.5 million dollars held in an account to cover future liabilities. And while the assembly has been considering more cuts to the city’s budget as questions about state funding hang in the balance, Wein wanted more information from city administrator Brady about which funds would be set aside. And there was a question, early in the meeting, of whether or not one assembly member could participate due to a potential conflict of interest. Assembly member Kevin Knox disclosed that only hours before the meeting, Knox’s wife had been offered a job by SEARHC. But Paxton determined it wasn’t a conflict. The APA and agreements for Sitka Community will now go to the SEARHC board for approval, and the hospital sale will be finalized on June 30 with a transition date of July 1. A previous version of the print copy of this story did not specify that assembly member Knox’s wife was offered a job by SEARHC. Though the audio version that aired on KCAW was correct and the audio included in the article was accurate, the detail was originally missing from the accompanying text, inadvertently suggesting that Knox was offered the job. The story has been amended to reflect that correction.